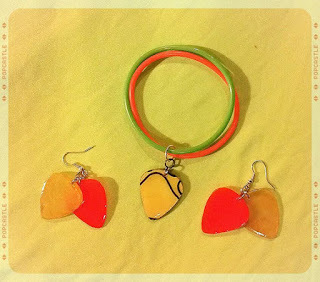 Neon Reflective Guitar Pick Earrings & Bracelet Set! Earrings feature Neon reflective guitar pick earrings made with Orange and Yellow reflective material. Bracelet features Reflective Guitar Pick Pendant (Glittery backside) with Green and Orange rubber bracelet.